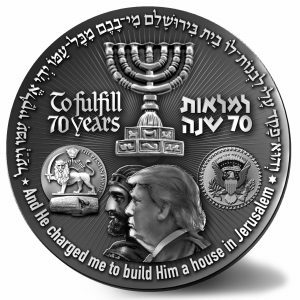 "And He – HASHEM, the Lord of the World – charged me to build Him a house in Jerusalem"
By Donating 50 Dollars to the Holy Temple you will get A Silver Plated Temple Coin. On the converse side, a dove-the universal symbol for peace- is holding an olive branch in his beak appears flying towards the Temple. 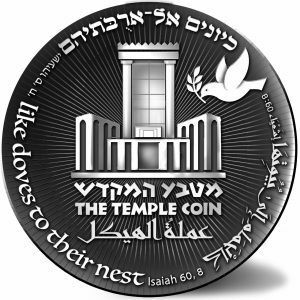 The DOVE has two origins in the bible: as Noah’s post-diluvian emissary and also from the Prophet Isaiah. 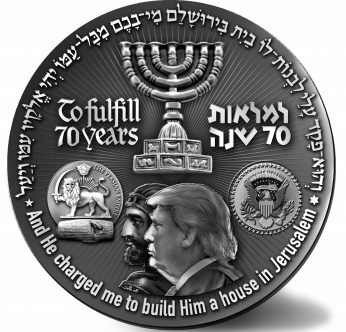 This verse is written in Hebrew , English and Arabic is a description of the Israeli People coming back home to the land of Isael and to the House of Peace.